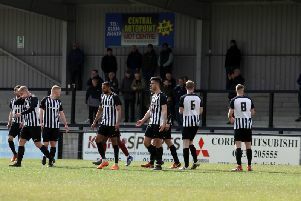 Steve Kinniburgh felt Corby Town produced “a complete performance” as they maintained their promotion push with an impressive 4-1 victory over Bedford Town at Steel Park. Goals from Delroy Gordon, his first for the club, Connor Kennedy, Joel Carta and top scorer Elliot Sandy wrapped up sixth home win in a row and extended the Steelmen’s unbeaten run to seven matches. Corby remain in third place in the Evo-Stik League South Division One Central, five points behind leaders Peterborough Sports and one adrift of Bromsgrove Sporting while they have two games in hand on the second-placed side. And boss Kinniburgh was pleased with what he saw from his team. “I thought it was a complete performance against a very good side,” the Corby boss said. “I said in the week that I thought Bedford were a team that was probably in a false position and underachieving this season due to their FA Trophy run. “They came and had a gameplan of what to do and we had to be at our best. “We had to make sure we were solid and, going forward, we had to make sure we had that bit of magic. “We know that if we get the defensive side of it right then we have goals in us. Kinniburgh, meanwhile, reserved special praise for midfielder Kennedy who has now scored eight goals this season having managed just two in the whole of the previous campaign. “He was outstanding,” Kinniburgh added. “I have been at the club for two years now and I think Connor, over the last 18 months, has gone from strength-to-strength. The Steelmen return to action with a trip to Barton Rovers next weekend.